Whenever I hear anyone earnestly claim that slavery is/was good for the economy, I feel like I have been punched in the stomach, twice. That is because I’m a neo-abolitionist and a scholar of economic growth who knows that slavery causes only poverty. My first seven books, from my dissertation (unpublishable at 1,300 pages) through Financial Founding Fathers, explored the finance-led growth hypothesis, the notion that financial services like intermediation and risk management cause economic growth. While writing those books, I noticed the crucial role played by the protection of human rights, especially the rights to life, liberty, and property, underlying financial development. That led to books like One Nation Under Debt and Little Business on the Prairie. I also noticed that economic growth was often impeded by irrational institutions and public policies of dubious quality, themes I explored in books like Broken Buildings Busted Budgets, Bailouts, Fubarnomics, Corporation Nation, Genealogy of American Finance, and, ultimately, The Poverty of Slavery. Nobody seriously doubts the claim that slaves were important components of many economies, especially the economies of slave societies like the antebellum U.S. South. But many important factors of production can be adduced and none of them are causal in any fundamental sense. What differentiates wealthy (high real output per capita) economies from poor ones is the incentive to produce goods for market. People in poor countries fear for their lives and property, just as the colonists in British North America did before, during, and just after the Revolution. The Constitution, and the policies enacted during the Washington administration, changed that and the U.S. economy has been growing at more or less modern rates ever since, subject only to the periodic and temporary reversals associated with business cycles. The U.S. economy should have, indeed would have, grown faster early on but it was held back by slavery, which created enormous negative externalities, or costs not borne by enslavers. Slave patrols, public whipping stations, standing military garrisons, and fugitive slave acts were among the most palpable ways in which enslavers milked taxpayers to keep their wretched system alive. The fact that slaveholders were heavily subsidized became widely understood by the late antebellum period and helped lead to the sectional break that ended in civil war. The Poverty of Slavery describes the negative externalities created by enslavement in great detail, not only in America but in every major slave society across the globe, from 10,000 BCE to the present. It pays particular attention to the ways in which enslavement changed in response to the Great Emancipations of the nineteenth century and, while doing so, defines slavery along a 20-point scale of freedom designed to allow scholars and activists to identify subtle differences in the lived experiences of sundry types of laborers, both free and unfree, across time and space. The final chapter explains that slavery must be ended, once and for all, because it is always a moral abomination and a drag on prosperity. Eradication must entail catching and convicting enslavers and stripping them of their wealth. Then, and only then, will they conclude that slavery does not pay and give it up. We will all be the better, both spiritually and materially, for de facto abolition. 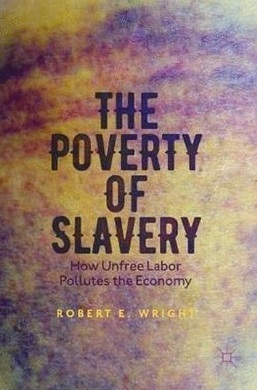 Dr. Robert E. Wright is the Nef Family Chair of Political Economy at Augustana University, and the author of over twenty books on American finance, slavery, and labor. In addition to being on of America’s foremost experts on economic history, Dr. Wright is also a board member of Historians Against Slavery. How about a SHEAR or an OAH Panel? How about recruiting a smart economic historian not connected with Johnson, Baptist, Bekert etc to comment on HNN or Huffington?–Any suggestions, Bob?